If you’re reading this on a desktop browser, you may not have noticed, but we just turned this blog on it’s head, design-wise. Those of you browsing on a tablet or mobile device, however, should be enjoying a much more comfortable reading experience. Now that’s not to say that we’ve been giving mobile the short end of the stick before pushing out the new code, but our approach to mobile has changed drastically since the redesign of this blog early last year and we’re really happy to be able to bring the lessons we’ve learned back here. Our initial approach to this site involved building out the desktop view as the default layout. We then used CSS3 media queries to “dumb down” the content by removing some page components and reconfiguring some of the content. 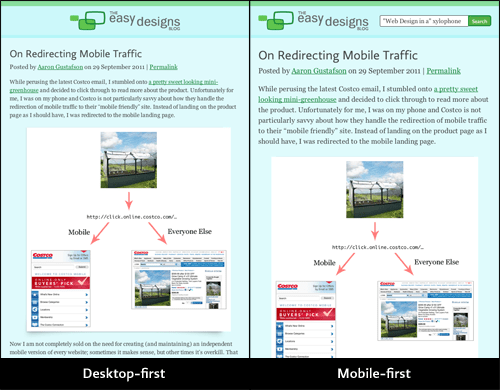 It worked pretty well, but we were relying on our mobile users to have media query support in their device. Given that our audience tends to have more capable mobile devices, it probably wasn’t an incorrect assumption, but it wasn’t all that kind to people who happen to have less-capable devices. And, in truth, it didn’t sit well with us because it didn’t really jive with the progressive enhancement philosophy I advocate so hard for. That said, the world of media queries was pretty new at the time. The biggest difference most people will see is the visual one. In its previous incarnation, this site only supported 2 resolutions: wide and narrow. It didn’t matter is you were on a tablet or a handheld device; you were getting the mobile layout. Under the new setup, the layout is far more nuanced, adjusting roughly 6 times. Some of the adjustments are subtle (such as relocation of search from the footer to the header as you cross the 570px mark), but others are more substantial (such as the introduction of sidebar content at 651px). Below are a series of screenshots depicting the differences between the two approaches at different milestones. A comparison of the narrow layout of this blog. The differences are pretty subtle, mostly having to do with spacing. 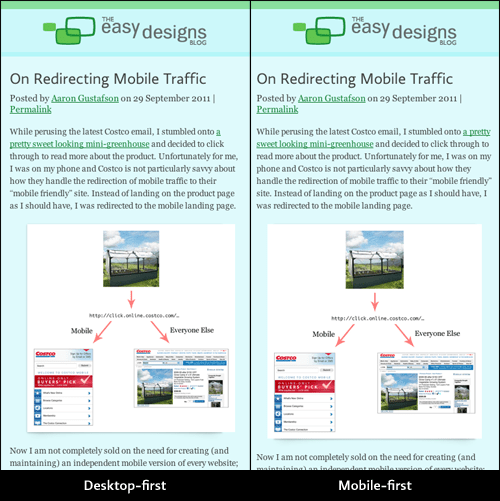 A comparison of the small screen layout of this blog. Small tablet and Kindle users benefit from slightly larger text. A comparison of the mid-size layout of this blog. Slightly larger tablets will get a sidebar (as appropriate) and the line lengths are a little better. A comparison of the wide/desktop layout of this blog. There are some minor spacing differences, but not much else has changed. Taken altogether, the differences don’t appear that substantial, but given that every device/browser has access to the narrow layout, the reading experience is vastly improved. Note: to get IE to apply media queries in versions 8 and under, we’re using the Scott Jehl’s Respond.js. Our content images are now being served via src.sencha.io, a free web service and CDN from the folks behind Sencha that takes the pain out of serving images based on the device requesting them. To keep the implementation simple (and easily swappable), I wrote an ExpressionEngine plugin to automatically swap images for their src.sencha.io equivalents (EE1 only for right now, but I’ll port it shortly). For more detail on using src.sencha.io, check out this article. Better support for services like Readability. We want you to be comfortable reading our content; if you don’t like our layout, that’s fine with us. What do you think? Did we miss anything that would make your reding experience better on this blog? PS - If you’re interested, I’ll be giving a full-day Adaptive Web Design workshop in Amsterdam on 29 November 2011, during which I will be discussing these topics and more in much greater depth and mentoring attendees on how to craft truly rich web experiences with progressive enhancement. Tickets are available on EventBrite.